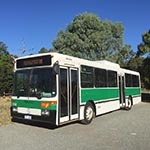 It gives me great pleasure to announce that recently-retired ex-Transperth / TransBusselton Mercedes-Benz O 405 (1114) has now found a new home in preservation. The bus changed hands on Friday 17 March and was picked up today (20 March). The acquisition of (1114) has allowed me to fulfill my wish of owning the first and last O 405/Volgren delivered to Transperth. This also means that the first and last of this very small class of buses (1106 being the class-leader) are now in safe hands. That is a very familiar melody I hear in the central coast from time to time ,but they are disappearing fast, being replaced by MAN 18.310s and 18.320s. Slight clunk into 2nd but nice hums from the orchestra of clutch packs and gears meshing in there. Its great that so many of the old buses are being preserved and its great that there are people out there with the resources to buy, store, run and (where necessary/desired) modify/fix/repair/restore these old machines. Swift wrote: Slight clunk into 2nd but nice hums from the orchestra of clutch packs and gears meshing in there. This was by far the nicest sounding unit out of the batch of nine (1106-1114). Right now, the load sensor is slightly out of adjustment which causes the occasional delayed lockup in second gear, but nothing consequential and certainly no unexpected roughness. Having never been to Perth, my impression was their standard use of BMACs on virtually every bus from the 1980s to 1990s. I thought there was a batch of high floor Voith gearbox 0405s from that era, which would have the UK sourced BMAC taillight assemblies. I have only managed to find one decent sound bite of a naturally aspirated Voithed 0405 (in the UK of all places! ), and while interesting, I was not personally taken with the combination from that recording anyway. I think the 0405 brings some of the best sounds out of the ZF, so I certainly favour your choice hands down! Love those original (but expensive -I've read) headlights. The VoV front looks great with them. Looks well kept, unlike Sydney's disgraceful buses both STA and certain privates. Swift wrote: I thought there was a batch of high floor Voith gearbox 0405s from that era, which would have the UK sourced BMAC taillight assemblies. However, one O405 CNG variant; 1094, had a Voith D851 3sp fitted to replace the failed Merc W3E gearbox. I can see why most others in that CNG batch (1091-1105) received the Allison B400R 5sp instead of the Voith - for one reason or another it just didn't work out that well, and was rather rough in its latter days when I rode it. According to a certain poster from WA who has scorn for STA Sydney's former MAN Sl202s with Voith, even he thought these NHs were a revelation with the DIWA "go between". What are they like from your perspective? Merc1107 wrote: However, one O405 CNG variant; 1094, had a Voith D851 3sp fitted to replace the failed Merc W3E gearbox. I can see why most others in that CNG batch (1091-1105) received the Allison B400R 5sp instead of the Voith - for one reason or another it just didn't work out that well, and was rather rough in its latter days when I rode it. (1094) was fitted with a second-hand Voith D863 that came from a Renault PR 100.2 (probably a CNG unit). It was never recalibrated to suit the lower revving Merc engine and therefore really never felt "right". Swift wrote: According to a certain poster from WA who has scorn for STA Sydney's former MAN Sl202s with Voith, even he thought these NHs were a revelation with the DIWA "go between". The NHs with Voith gearboxes were weapons when new and many still are to this day. They are generally silky smooth both up and down the gearbox but with age, some are a little rough around the edges, albeit in different ways to similar buses fitted with ZF Ecomat gearboxes. Some will thump back into 1st gear on slowing down when the retarder disengages, others with flare from 1st to 2nd or 'grab' when the retarder is applied but most are still very enjoyable to be a passenger on. Just like Busways MAN 18.320s here in NSW, the Voith can be a respectable performer with a torquey enough engine. It seems the common factor with good performing Voith equipped buses is having a turbocharger in the mix. All buses that I have experienced or heard about that were quick with Voith have forced induction!! Swift wrote: It seems the common factor with good performing Voith equipped buses is having a turbocharger in the mix. Personally, I find the performance of the Adelaide MAN SL 202 diesel buses with Voith D851.2 gearboxes to be more than satisfactory. They have the D2866 UH (12L, 230hp) engine, as opposed to the D2566 UH (11.4L, 200hp) engine on the Sydney examples. Yep, in other words, good torque curve. Sydney's examples were extremely peaky, based on the three pointed star's 11.4l 0305 motor, but with most torque not arriving until the governed 2200 rpm speed. No wonder the sole example fitted with an Allison World Series, 3271 made a world of difference to performance, keeping revs nearer to the peak torque level much more often during the acceleration phase. That bus was a super star in comparison to it's Voith Turbo brothers where the engines repressed down low in the rev range, well away from the much needed torque. The Adelaide examples were based on the beefier 12l 0405 motor which obviously has a much better spread of torque for the Voith 851.2 to exploit. Swift wrote: Yep, in other words, good torque curve. Sydney's examples were extremely peaky, based on the three pointed star's 11.4l 0305 motor, but with most torque not arriving until the governed 2200 rpm speed. No wonder the sole example fitted with an Allison World Series, 3271 made a world of difference to performance, keeping revs nearer to the peak torque level much more often during the acceleration phase. That bus was a super star in comparison to it's Voith Turbo brothers where the engines repressed down low in the rev range, well away from the much needed torque. The D28/(O)M 447 motor delivers more peak torque and at lower RPM than the D25/(O)M 407, but that's only half the story. The Voith SL 202s in Sydney were delivered with a diff ratio of 5.22:1, which is taller than the diff ratio that the ZF SL 202s had from new - 5.937:1. Just as well they had that 5.22:1 ratio, otherwise they would have been lucky to reach 70 km/h with a three speed Voith! Most drivers loathed them because they wanted the punchy launch feel of the Mercedes, where the MAN definitely did not feel like that. You put the foot to the boards and the bus just moved off like you were feathering the pedal. I came to appreciate that characteristic about them as a driver and they were the most reliable and fuel efficient bus in the fleet! There was one driver who wouldn't drive anything else. A depot dispatcher told me once that you could extract another half day out of them before they needed refuelling! EDIT: back to topic, could we see a rear view of the bus? ?